“What I love most about the JCC is the sense of community. It’s hard to describe but it’s 100% different than any other regular gym. 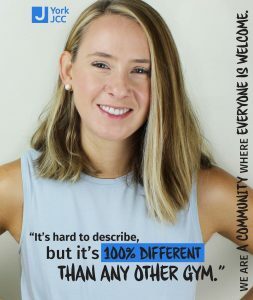 The trainers are more personable, the babysitting room and sitters are more than caring, the classes are incredible, and I’ve just loved getting to know all of the people I get to work out with daily. I gained around 60 pounds while pregnant with my oldest son. I was able to lose about 30 pounds after having him but then plateaued. While pregnant with the twins, I was able to keep my weight in control, but I wasn’t able to lose much. JCC start weight: 164 lbs.